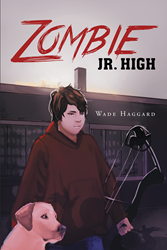 Recent release “Zombie Jr. High” from Page Publishing author Wade Haggard is both thought-provoking and chilling; this work follows the main character, Gil Gillenwater, as he fights zombies and tries to save his small town. Wade Haggard, an outdoor enthusiast, traveler, poet, devoted writer and author, has completed his new book “Zombie Jr. High”: a creative and captivating journey of intrigue, mystery, fear and science with several unexpected moments. This book is the perfect read for any science fiction fan! Published by New York City-based Page Publishing, Wade Haggard’s original work will keep the reader guessing through the gruesome fights and exhilarating schemes! When Gil Gillenwater, a thirteen-year-old brain trust of whimsical energy, stumbles on what he believes to be an accidental chemical spill, he unknowingly becomes the center of a plot to keep secret a black-op scheme to manufacture the undead. The first year of junior high should be the greatest of Gil’s life. Instead, he finds himself, his older brother, and a small group of friends within containment boundaries of a small town, fighting infectious beasts and searching to rescue the young niece of the lead scientist on the seditious project. Gil applies his intelligence and problem-solving skills, combined with his off-color wit, to navigate the maze of the broken and infested community. During his journey, he uncovers the nature of the fiends he fights and reveals the true intent behind a government-contracted security force and their leader’s desire to animate the dead with microorganisms, creating a zombie army. Gil soon learns one can’t fool Mother Nature as death spreads among the living, unleashing legions of animates in this once quiet town. Gil, who has never been one to accept the obvious, finds and exploits a weakness in the creatures, luring them to the town’s junior high school, only to be betrayed in an attempt to silence him before he can warn the outside world of the dangers if the beasts escape Zombie Junior High. Readers who wish to experience this enthralling work can purchase “Zombie Jr. High” at bookstores everywhere, or online at the Apple iTunes store, Amazon, Google Play or Barnes and Noble.